A patchy lawn can be the result of an attempt to grow grass in shade or a high-traffic area, a fungal disease or poor lawn cultivation practices. Lawns where growth is not uniform can be repaired through the practice of reseeding. Reseeding a lawn puts more grass seed down and encourages growth in areas where the lawn grass will not currently grow. But unless the problems that caused a patchy lawn are corrected, reseeding is a temporary fix at best. Reseed in early fall or late spring—grass seed often will not germinate in the middle of summer’s heat. Mow your current lawn grass to its lowest healthy height—typically this is between 1 and 1½ inches. This will allow light to reach the new grass and help it germinate. 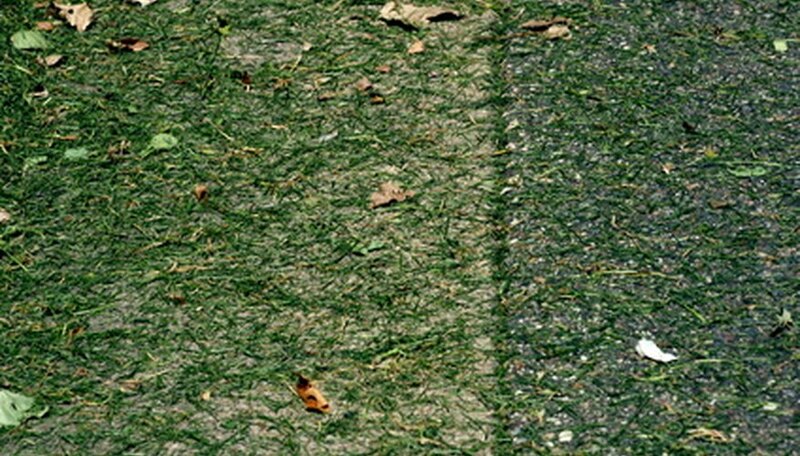 Measure the thickness of the lawn thatch on your lawn. If the lawn thatch is thicker than 1 inch, rent a dethatcher and remove a layer of thatch from the lawn. Aerate your lawn with a lawn aerator to help add oxygen and nutrients to the soil and to give lawn seed access to the soil so that it can germinate. Push the aerator over your lawn up to four times, varying the path each time. Aerate until there are approximately 40 to 60 aeration holes in your lawn per square foot. Pour seed into a broadcast seeder and set the machine to distribute seed as you push the machine over your lawn. A broadcast seeder contains a holding chamber and a reel designed to fling seed across the path that you push it over. Water the seed up to four times daily with ¼ inch of water per 1 inch of soil. Decrease the watering frequency gradually once the seeds germinate. Eventually you should water your lawn with 1 inch of water every 10 days. Continue to mow your lawn between 1 and 1½ inches until the new seed reaches this height. Then raise the deck of your mower so that your grass is between 2 and 2½ inches tall. Lawn thatchers and aerators operate similarly to lawnmowers in that they have a rope-pull starter and are pushed over the lawn. You can rent them from a lawn-and-garden store.